Paper Road Press is pleased to announce that the first six SHORTCUTS novellas will be released as a paperback collection this November. Writing on the theme of strange tales of Aotearoa New Zealand, seven Kiwi authors weave stories of people and creatures displaced in time and space, dangerous odysseys, and even more dangerous discoveries. Originally published as standalone ebooks, these novellas explore New Zealand with new eyes, finding the uncanny in the familiar and shining a light on some things we might prefer to pretend were unfamiliar. 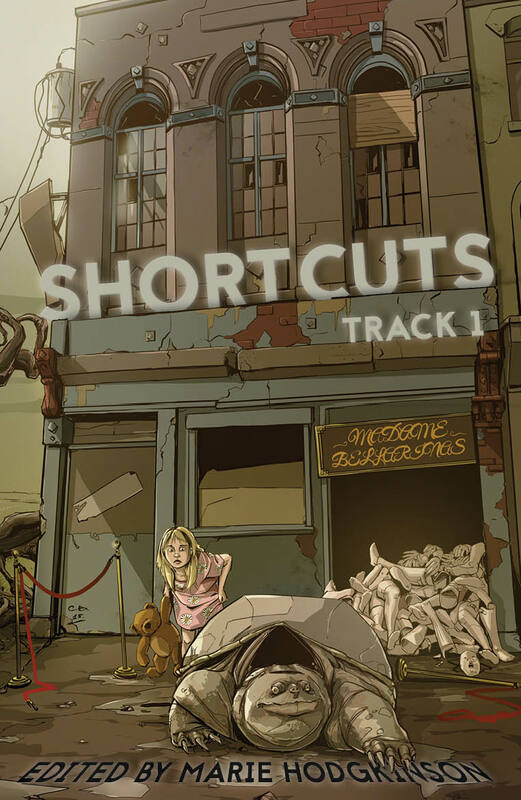 SHORTCUTS | Track 1, which collects together the six novellas we published in 2015, is now available to pre-order. In recognition of the tyranny of distance postage fees we face as a publisher based in the south of the South Pacific, we are offering two contests for readers: one for New Zealand orders, and one for international (…and New Zealand) orders. Pre-order now for New Zealand delivery. Parcel post fees from New Zealand to, well, anywhere else on the globe can get pretty steep. We know that you probably don’t want to pay more for postage than for the book itself, so for our international readers, the SHORTCUTS collection is also available for pre-order through Amazon, and will ship immediately on publication in print and ebook formats. To be in to win a $50 Amazon voucher, simply Tweet (@paperroadpress) or email us a snapshot of you* with your copy of the paperback or ebook before 15 December 2015. Click here to pre-order through Amazon. *Since we know not everyone wants to show their mug to the internet, for the purposes of this competition, ‘you’ can mean, for example: your hand; your cat; an exciting rock; luminous spheres. All entries for both competitions will be assigned a number based on when we receive their entry, and winners will be chosen by random number generator. The random number generator’s decision is final. No correspondence will be entered into, except with the winners, to find out where to send their stuff.